The husband and wife design duo, Charles and Ray Eames, are most often associated with their beautifully contoured chairs that became a visual hallmark of postwar California culture. Charles Eames, who had worked with architect Eero Saarinen at Cranbrook Academy in Michigan in the late 1930s, began experimenting with molded plywood, which would become a key element in his future furniture projects. The history behind the Eames’s iconic designs began in 1942 with their contribution to the war effort as the United States Navy commissioned them to produce a more lightweight plywood leg splint for use aboard warships. 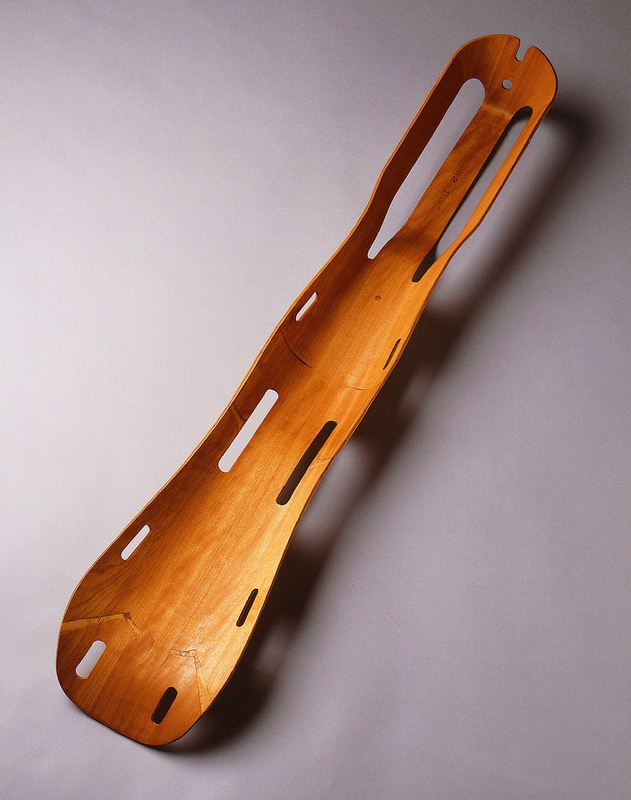 The splint was the Eames’s first design to go into large-scale production. By the end of World War II, over 150,000 had been produced. The undulating, ergonomic form replaced older metal designs with laminated and molded birch plywood that was functional, strong and lightweight, as well as visually and tactilely appealing. Charles and Ray Eames would continue to reimagine every day objects for the next three decades, creating a long lasting legacy in the world of modern design. Jason Weems, War Furniture Charles and Ray Eamse Design for the Wounded Body, Boom: A Journal of California, Volume 2, No.1 (Spring 2012), 46-48.